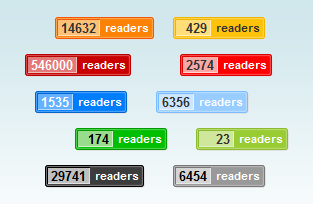 Why does FeedBurner Subscriber Count Keeps Changing? Know about the reason why FeedBurner’s subscribers count keeps fluctuating. It is the stand-alone feed reader software that cause it. FeedBurner is a service that manages your feed, subscriptions and statistics related to your feed. This service was acquired by Google in 2007 and since then it runs on a subdomain of Google. After logging in to your FeedBurner account, you can see how many people have subscribed to your RSS feed. But this count keeps on changing. One day if FeedBurner is showing that you have 2218 readers –the next day count may come down to 2207 and the next day it might suddenly shoot up to 2229. Why this FeedBurner count changes so much? This is a question that strikes a large number of people who distribute their RSS feed via FeedBurner. READ: Why FeedBurner Chicklet is showing zero count? The answer to this mystery lies in understanding what FeedBurner reader count means. FeedBurder’s reader count does not mean that you have so many subscriber under your belt and the number will only go up from there (unless of course someone unsubscribes) . Now let’s examine these three categories in detail. Number of email subscribers does not drastically change. This number usually go only upward as more and more people opt for email subscription of your feed. Sometimes it may come down if more number of people unsubscribe. Count of those who have subscribed to you through a web based feed readers (Like NetVibes) –also remains more or less stable and go usually upward. Even if you don’t use them, web based facilities do automatically check for new items in subscribed feeds several times every day. So, FeedBurner counts all such subscriptions in. During the weekends, for example, when many people don’t switch on their computers, their stand alone reader software will not be able to contact FeedBurner and FeedBurner will not count them in for that day. So, on weekends, the readers count is likely to be lower! To summarize it all, FeedBurner readers count shows the number of unique feed requests on a particular day. Stand-alone software, if not switched on, don’t make feed request and therefore pull your readers count down. Last updated: 23 September 2017 | Published on: 3 June 2012 | Authored and Edited by: Lalit Kumar and Team | Filed as: Home » Internet » Google » Why does FeedBurner’s Reader Count Keep Changing?